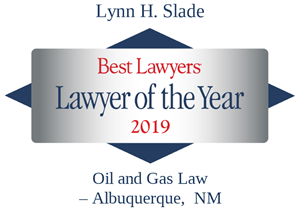 Lynn Slade serves clients’ needs addressing Federal Indian law and Native American law, energy, natural resources, environmental law, project development, complex litigation and transactions for over 30 years. In his Indian law practice, Lynn advises and counsels natural resource and energy developers, financial institutions, utilities, and other businesses in transactions and project development, including extensive involvement with renewable energy projects. He also leads litigation teams in disputes concerning resource development, environmental regulation and business activities on Indian lands. In addition, Lynn represents oil and gas exploration and production and mid-stream companies in transactions and regulatory compliance as well as financing and equity investing parties in the purchase, sale, financing and operation of oil and gas producing and transportation assets and has represented participants in gas and electric markets before federal and state agencies. Lynn Slade’s experience in energy markets includes both renewable energy, including solar, hydroelectric, biomass, and wind energy projects, and fossil fuel or conventional energy resources, including oil and gas exploration and production, royalty accounting, and taxation, and negotiation and drafting of leases, joint venture agreements, and pipeline or transmission rights-of-way agreements. On the litigation side, he has been involved in federal, state, and tribal trial and appellate courts in numerous states, and provides counsel in complex mediations and arbitrations. Lynn’s clients include Enel Green Power, Enterprise Product Partners, Kinder Morgan, Continental Resources, Sempra Energy, and have included the State of Oklahoma, including its Tax Commission and Department of Environmental Quality. 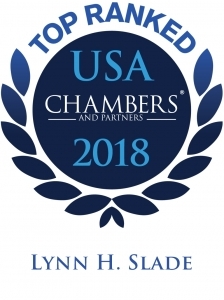 Chambers USA has recognized Lynn with a top Band 1 rating nationally in Native American Law and named him a Star Individual in New Mexico. In the 2017 publication, Chambers reports, “One source describes Lynn Slade as ‘the godfather of New Mexico Indian law.’ One interviewee stated, ‘he has as good a grasp of the interface between tribal, state and federal law as anyone I know. '” His practice encompasses environmental law, energy work and project development. 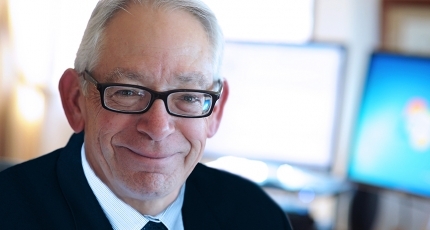 For more than twenty-five years, he has been listed by Best Lawyers in America®, and named Lawyer of the Year – Albuquerque in multiple areas and years: Oil and Gas Law, 2014 and 2019; Native American Law, 2012; Natural Resources Law, 2012; Energy Law, 2011. Additionally, he has been listed by Southwest Super Lawyers®, and Benchmark Litigation as a local Litigation Star. Lynn serves as Co-Chair of the firm’s Native American/Federal Indian Law Practice and is a member of the Natural Resources and Environment; Oil, Gas & Midstream; and Renewable Energy Practice Groups. Lead counsel for Enel Green Power in successful defense of 150 MW wind generating facility against challenge by United States that wind tower excavations constituted mining requiring tribal mining lease. United States v. Osage Wind, LLC, No. 14-cv-704-JHP-TLW (September 30, 2015), on appeal, 10th Cir. No. 15-5121. Represents oil and gas exploration and development companies with respect to title and development issues, including defense of title to claims based on movement of Missouri River in EEE Minerals v. State of North Dakota & Continental Resources, No. 1:16-cv-00115, U.S. D. Ct., Dist. of North Dakota, and advice and representation regarding lease termination issues, Fort Berthold Reservation, North Dakota. Represented an engineering firm in tribal court and Louisiana state trial and appellate courts in defense of the firm’s successful efforts to enforce contacts that provided for state court, rather than tribal court, jurisdiction. See, Meyer Engineering v. Coushatta Tribe of Louisiana, 992 So.2d 446 (La. Sup. Ct. 2008), cert. denied, 129 S.Ct. 1988 (2009), 2009 U.S. LEXIS 2638. Represented QEP Field Services in ensuring continued operations of major oil and gas field facilities. QEP Field Services v. Ute Indian Tribe of the Uintah and Ouray Reservation, 2010 U.S. Dist. LEXIS 78844 (D.Utah 2011). Led Modrall Sperling teams, and appeared as counsel of record, in representing amici curiae, including the Association of American Railroads, in a series of cases that have served to better define the scope of tribal jurisdiction over nonmembers in the areas of court jurisdiction, regulation, and taxation. See, Dollar General Corp. v. Mississippi Band of Choctaw Indians, U.S. Sup. Ct. No. 13-1496 2016); Strate v. A-1 Contractors, Inc., 520 U.S. 438 (1997), Atkinson Trading Co. Inc. v. Shirley, 520 U.S. 438 (1997) (taxation); Plains Commerce Bank v. Long Family Land & Cattle Co.,554 U.S. 316 (2008) (court jurisdiction). Represented the City of Albuquerque in appellate review of rulings in an Endangered Species Act challenge to plans to use interstate diversions to support municipal water supplies. See, Rio Grande Silvery Minnow v. Keys, 333 F.3d 1109 (10th Cir. 2003). Represented El Paso Natural Gas Company in appellate proceedings that resulted in the rule that federal court has initial jurisdiction to determine whether tort claims arising from nuclear incidents should be heard in state, federal, or tribal court. See, El Paso Natural Gas Co. v. Neztsosie, 526 U.S. 473 (1999). Counsel for Transwestern Pipeline Company in litigation yielding the rule that the arbitrator, not a court, may decide enforceability of arbitration agreements. See, Transwestern Pipeline Co. v. Blackburn, 831 S.W. 2d 735 (Tex. App. — Amarillo 1992). Investment in Indian country: Advises and develops forms and standards for major national investment managers regarding transactions with Tribal Nations. Rights-of-way: Counsels several pipeline and electric utility industry participants on acquisition, renewal, and maintenance of rights-of-way on federal and Native American Lands; counseled and prepared comments and objections posed to proposed regulations governing rights-of-way of U.S. Bureau of Land Management and Bureau of Indian Affairs. Oil and gas development agreements: has advised exploration and production companies in negotiation, drafting, and planning for administrative approval of large-scale oil and gas development agreements on tribal lands. Solar Energy Development: Served as Native American/Federal Indian Law counsel to K Road Energy with respect to leases of tribal lands for large scale photovoltaic developments on lands of the Moapa Reservation, Nevada; Chemehuevi Reservation, California; and others. Advised Sempra Energy regarding utility-scale wind energy project development on the Navajo Nation, Arizona, and power purchase agreement with multiple tribal utilities in Arizona, Nevada, and California. Negotiated and drafted oil and gas exploration and production leases, joint venture agreements, and pipeline rights of way agreements, Navajo Nation, Arizona and New Mexico; Southern Ute Tribe, Colorado; Northern Ute Tribe, Utah; Jicarilla Apache Nation, New Mexico; and Wind River Reservation, Wyoming. Represented Portland General Electric in negotiation and drafting of joint venture agreement for the Pelton/Round Butte Hydro-Electric Project with Confederated Tribes of the Warm Springs Reservation, Oregon. Contributing Editor, Landman’s Legal Handbook, 5th ed., Rocky Mtn. Min. L. Fndn.